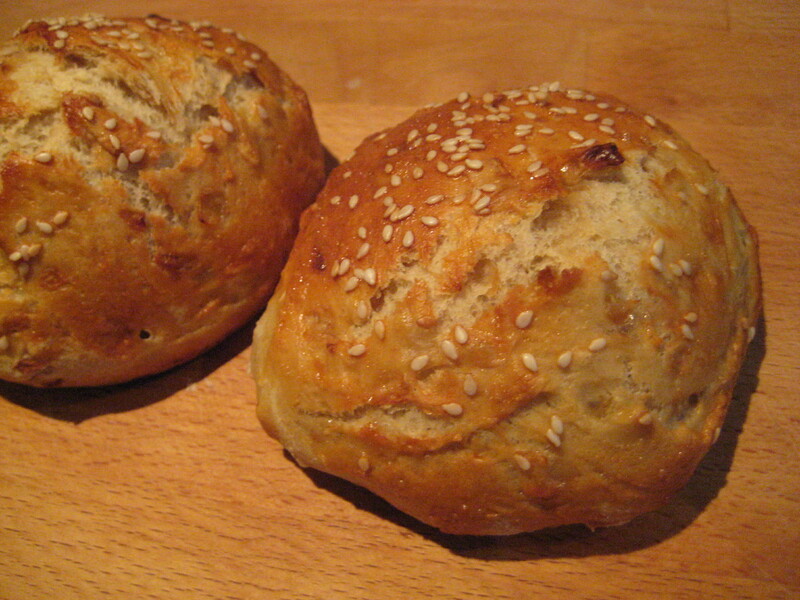 Just a quick post today, a friend’s fantastically simple recipe for onion rolls. Not only are they ridiculously easy to make, but we made them Sunday night and they were still delicious on the Wednesday, and probably would have toasted well right to the end of the week (although I can’t say for definite as mine were gone before then). Stir together the yeast, sugar and 125ml warm water, leave it somewhere warm(ish) for 10 mins or until it’s gone frothy. Gently fry the onions until they’re soft and golden. Stir sieved flour and salt in with onions and make a well, pour in the yeast and extra warm water (up to 250ml) until it forms a soft dough. Add flour if the situation gets a bit sticky. Knead for 10 minutes or until you feel the texture of the bread change to become bouncier. Place the dough in a bowl, lightly oiled will help the sticking issue, and cover with greased clingfilm. Leave somewhere warm for an hour or so. Grease some baking trays. Punch the air out of the dough, knead for another minute on a floured surface, divide into 12 pieces and place on tray. Preheat oven to 180 C. Cover rolls loosely with a damp tea towel and leave to rise somewhere warm for 30 mins. Aha! More bread experiments. These rolls look yummy. If you’re looking for any sourdough ideas check out Clotilde’s chocolate bread at http://chocolateandzucchini.com/archives/2010/07/chocolate_starter_bread.php. They were delicious, and really useful for lunch for work! Ooh crazy, you made it before? I’m trying it this weekend, I’ll let you know how it goes!